To crush my enemies, to see them driven before me, to hear the lamentations of their women. I enjoyed it. I would give a 7.5 Really liked the Arya/Hound scene. They are doing a great job building a dynamic between those to characters...yet i tend to say that about everyone Massie is on screen with. I think the things that turned me against this episode a bit was the level of cheese and melodrama. The ending with Dany for example. I think it was unnecessarily over the top. I liked the scene with Jon and Eggritte but again I think they heavy handed it to much. Kit Harringtons looks of "She shot me...I can't believe she really shot me" was his best acting of the whole series. Powerful stuff with Greywinds head and Robs body. I liked the Stannis scene although I think they lost a bit of opportunity for how much Stannis grows at exactly this moment. The whole realization of putting the cart before the horse was such a defining moment and they downplayed that part a bit much. Overall it was a good builder episode which is true to form for the show. I just think whichever director this was went a bit more meat fisted then i like. Loved the episode. 9.5 I thought this TV dario was vastly superior. I actually could beleive why Dany was intrigued by his base cunning and swagger. In the books I always had a hard time understand what Dany was doing with this clown. Sam the slayer scene was awesome. I was a little bummed they cut the bit about Wildlings not naming children until a year in. 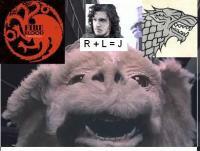 Although they did make good use of comparing Randell to Craster. As for the wedding cloak....i don't think there was a way around it for times sake. The only idea I had was they could have had tyrion fumbling at it...tugging...then cut scene and come back to it to show a period of time took place and she did her small subtile protest left to her. All and all I was fine with the change. I have the Skyrim Blues.